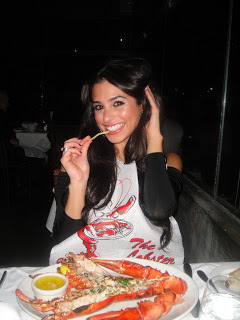 Last night I had the most amazing dinner at The Lobster on Ocean Avenue in Santa Monica. It’s right next to the Santa Monica pier, and it’s open for lunch and dinner. If you love seafood, you will love this restaurant. It’s romantic and beautiful for dinner, and it is the best place to go during the summer while the sun is setting for happy hour! It’s right on the ocean. When you make a reservation, request for table near the window so you have beautiful views of the SM pier and the ocean. This place is definitely upscale, not one of your hole in the walls. Menu prices are pricey, but worth the money in my opinion for special occasions. If you are on a budget, I recommend going for lunch or happy hour. You can order appetizers or shellfish, or their famous Santa Monica Style Lobster Roll, Kobe beef cheeseburger, or grilled chicken pita sandwich which they serve until 3pm. Take a look below to see what I ordered. I highly recommend everything, and in my opinion I think they are the best choices on the menu. Proper presentation is tremendously important. You need to make it well in order to make it look delicious. Plating is certainly important in restaurant and catering business. We actually took one month to learn the proper procedures in food presentation.